Using a stand mixer fitted with the whisk attachment or a hand mixer in a large bowl, beat cream and sugar until cream starts to thicken. Start slowly and gradually increase speed as cream gains texture. Beat until cream reaches desired consistency. (Don’t beat too long, or you’ll get butter.) Stir in vanilla extract, if using. Whipped cream is best used soon after it is made, but you can store it for up to 1 day. Line a strainer with a piece of dampened cheesecloth, spoon cream into strainer, place strainer over a bowl, and wrap bowl and strainer in plastic wrap. Place entire setup in refrigerator. The cream will lose its excess moisture and thicken. Because chiffon cakes rely on egg whites rather than gluten to rise, they work like a dream even when gluten free. This citrus chiffon cake is light and fluffy and tastes like you made it with ordinary cake flour. Use fresh eggs, because the egg whites will fluff up more when beaten. The original recipe calls for Bob’s Red Mill gluten-free flour, but I used the Trader Joe’s variety and it worked great. The citrus flavor of the cake is subtle, so either use the marmalade filling or eat the cake plain. Only frosting with whipped cream will wash out the cake’s citrus flavor and make the whole thing taste plain. The gluten-free cake dries out fast compared to regular cake, so if you won’t finish eating it the day it’s made, you should definitely frost it with whipped cream to keep it moist. Preheat oven to 325°F and set aside two 8″ round baking pans OR 10″ tube pan OR angel food pan. If using round cake pans, line them with aluminum foil to make cake removal easier. In a medium bowl, combine flour, baking powder, salt, and 1 cup sugar. Set aside. In a clean large bowl, beat yolks, milk, oil, vanilla extract, and zest until thoroughly combined. Add the flour mixture to yolk mixture and beat until well blended, about 2 minutes with an electric mixer. In a separate large mixing bowl, whip the egg whites with 1/2 cup sugar and cream of tartar until stiff and glossy. Add a large scoop of the whipped egg whites to the cake batter and mix gently but thoroughly to lighten the batter. Divide batter between pans and gently smooth tops with a rubber spatula. Bake at 325°F for 25 minutes without opening the oven door during this time. Increase heat to 350°F and bake an additional 15-20 minutes. The cakes are done when a toothpick inserted in the center comes out clean, or when the surface springs back immediately after pressing on it with a finger. Scoop 1 1/2-2 cups frosting into a small bowl, and fold in 1/3 cup marmalade to make the filling. Place one cake layer cut side down on a serving plate and spread with 1/2 of the filling. Top with the second layer cut side down and spread with the rest of the filling. Top with the third layer, cut side up. Refrigerate the cake if you’re not serving it the same day. One of my friends loves fresh whipped cream, so I decided to make pound cake as a whipped cream delivery mechanism. It’s a conveniently robust recipe – if you don’t have lemon peel, you can substitute grated orange peel or even 1 teaspoon of lemon juice. I was out of milk as well, so I mixed together 1/8 cup heavy cream and 1/8 cup water, and it worked fine. 1. Preheat oven to 350°F. Grease and flour 9x5x3″ metal loaf pan. 2. Beat together butter and sugar until light and fluffy. 3. Beat in eggs, vanilla, and lemon peel. 4. Beat in baking powder and salt, followed by flour. 6. Pour batter in pan, smooth top, and bake for 55-60 min. 7. 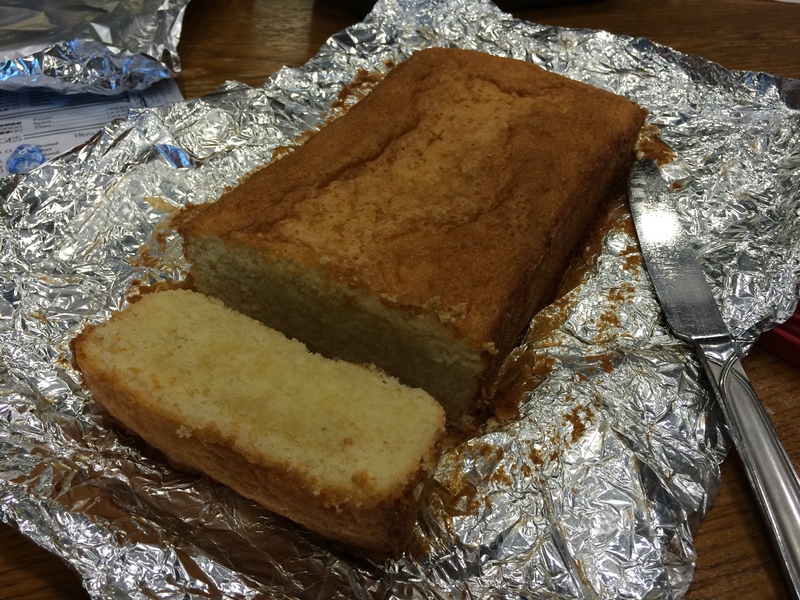 If using pound cake as a delivery device for whipped cream, beat together 1 cup heavy cream and 1 tablespoon sugar.